Antonello Venditti was born in Rome, the son of Vincenzino Italo from Campolieto, in Molise, deputy prefect in Rome, and Wanda Sicardi. He studied piano in his youth and made his debut in the music world in the early 1970s at the Folkstudio of Rome, together with singers like Francesco De Gregori and Giorgio Lo Cascio. In duo with the former he released in 1972 his first LP, Theorius Campus. The LP scored little success, but Venditti at least made himself noted for the strength of his vocal qualities and for his attention to social issues, evidenced by pieces like “Sora Rosa”, sung in Roman dialect. Also in dialect was “Roma Capoccia”, a declaration of love for his city, which later became one of his most famous songs. Venditti’s fortunes grew and peaked in 1975, with the LP Lilly. The yearning title-track was another strong accusation, this time against drugs, but it achieved an outstanding success anyway. Other famous pieces in the album were “Compagno di scuola” (“Schoolmate”) and the long ballad “Lo stambecco ferito” (“The Wounded Ibex”), the story of a corrupt Northern Italian tycoon. Venditti continued to deal with front-page matters in his next LP, Ullàlla (1976), whose “Canzone per Seveso” was about the industrial accident in July that year. Political involvement, however, had side-effects on Venditti’s inspiration in the late 1970s, marked in Italy by the growing menace of terrorism and by the strategia della tensione: some events (like the public booing of his friend De Gregori by politicized fans during a show) forced him to rethink his way of being a public personality. Sotto il segno dei pesci (“(Born) Under Pisces”, 1978) contained more personal and intimate themes. The eponymous track scored a great success, but was largely misinterpreted as a song about a woman: it actually referred to Venditti’s career, as he was in fact born “under the Pisces sign”. Success was, however, marred by his divorce from his wife Simona Izzo. She won custody of Venditti’s son, Francesco Saverio. The following LP, Buona domenica (1979), was strongly marked by this difficult period. It contained, however, several classics, like the title-track and the ballad Modena, which featured Gato Barbieri on saxophone and is considered one of Venditti’s finest works. In 1982 the bitter Sotto la pioggia marked Venditti’s passage to his own label, Heinz Music, and the beginning of the long-lasting collaboration with producer Alessandro Colombini. The following year A.S. Roma, his city’s football team, won its long-awaited second scudetto: Venditti was therefore called upon to take part in the official celebration show, and the song that he composed for the occasion, “Grazie Roma” (“Thank You Roma”), turned into a great success, surprisingly not just in Rome. Venditti had already composed several songs about his favourite football team; some people criticized them harshly, mostly because of the strong contrast with the political-social themes of his other songs. In the following years, and notably in the 1990s, Venditti’s inspiration seemed to become more mainstream and commercial. His LPs (Cuore, In questo mondo di ladri, Benvenuti in Paradiso, Prendilo tu questo frutto amaro) were very successful, but his former themes were absent, or generally less stressed. Pieces like “Notte prima degli esami” or “Ma che bella giornata di sole” (about the Italian Liberation Day of September 1943) were anyway praised by critics. Among the songs of this period, “Dolce Enrico”, from the LP Benvenuti in Paradiso (1991), was dedicated to the former leader of the Partito Comunista Italiano, Enrico Berlinguer, who died in 1984. Antonello nel Paese delle Meraviglie (“Antonello in Wonderland”) of 1997 featured his greatest hits accompanied by the Bulgarian Symphony Orchestra of Sofia, directed by Renato Serio. Goodbye Novecento(1999) gave increasing attention to social and historical themes, but had a sub-par success by Venditti’s standards. In 2001 A.S. Roma again won a scudetto, and Venditti played again in a free concert in the Circo Massimo for an immense audience of tifosi and lovers of his songs. His latest studio release is Che fantastica storia è la vita (“What a Fantastic Story Life Is”, October 2003). Gato Barbieri played with Venditti in this release. After resolving the difficulties in his friendship with Venditti, told in the latter’s 1979 song “Scusa Francesco” (“Sorry Francesco”), De Gregori is also present as singer in “Io e mio fratello” (“Me and My Brother”). 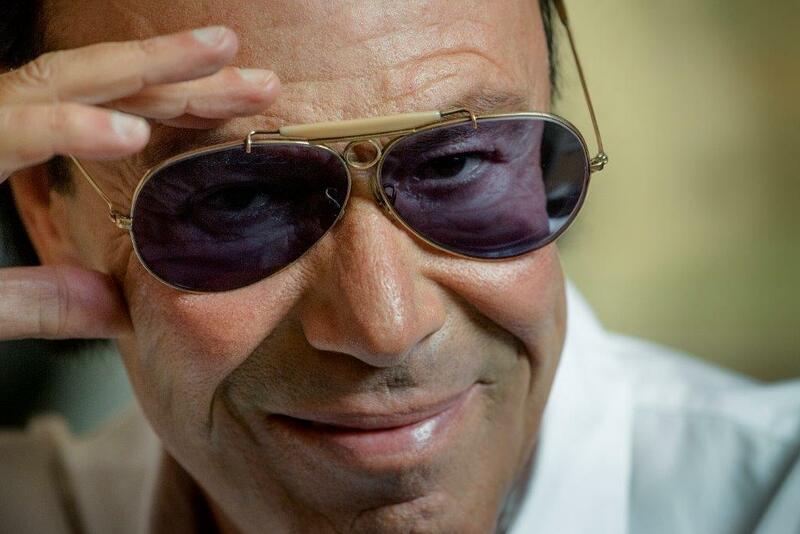 The album also contains a satire of Italian Prime Minister, Silvio Berlusconi (“Il Sosia”). In April 2008, in an interview with a Catholic website, Venditti spoke of his faith in Christ, his devotion to Padre Pio and his respect for Pope Benedict XVI, and also mentioned having been assaulted when he was sixteen by a malevolent entity which he identified with Satan. This led the media to class Venditti with other high-profile show-business converts like Claudia Koll (who was also attacked by a malevolent entity) and Giovanni Lindo Ferretti, although actually his conversion long predates theirs. In October 2009 Venditti was criticized for asking, during a concert in Sicily, “Why did God create Calabria?” and declaring that “there is really nothing” in Calabria, a region in South Italy. In the past it was colonized by the ancient Greeks and became the cradle of Magna Graecia, but now it is also the base of the modern crime organization ‘ndrangheta. Venditti later made peace with Calabria over a cup of good coffee at his house in Rome with the mayor of Reggio Calabria, Giuseppe Scopelliti. In November 2011, Venditti released his new album, named Unica. The following tour started in march of 2012 in Rome and ended in September 2013 in Turin. The special track “Io l’orchestra le donne e l’amore” was performed at the Arena of Verona. In January 2014, Venditti started his small sold-out tour ‘Ritorno al Futuro’, which consists of the songs from the 1970s and 1980s, such as “Lo stambecco ferito”, “Marta”, “Compagno di scuola”, “Campo de’ Fiori” and others. Venditti’s latest album is Tortuga, released in 2015.